In the world of work and business, we have been taught to lock away our heart, but if we’re going to lead and inspire others, we need to keep our hearts open. Research shows that it is the heart that motivates us, engages others, and determines what we do in life. The heart, not the mind, inspires our greatest achievements. The heart of a Difference Maker is compassion and at the center of everything they do. The heart is the source of infinite imagination and creativity, allowing them to lead, to serve, and to connect with others in incredible ways. So, what causes them to guard their hearts? Fear of being hurt or judged, Difference Makers may keep their dreams silent and become reluctant to let others in. This disconnection or isolation may cause them to slowly struggle forward or stagnate because they lack the momentum that comes from connecting with others. It is no wonder that Difference Makers find refuge in a community of like-minded leaders, and when they do, they begin to live more open-hearted and authentic. Your heart has a melody. It is a song that leads to clarity, answers, and assurance. Following the melody of your heart means to create your life from your heart center, a life that serves you and others. It’s the determination to overcome everything that has silenced your music and the courage to live unapologetically – transforming from who you’ve known yourself to be into who you really are. Are you tuned in to the melody of your heart? On a scale of 1-5, 1 being “never” and 5 being “always,” rate the extent each statement is true. I bravely pursue the dreams and interests that make my heart sing. I feel a sense of alignment and connection with my work. I use self-talk that supports me to live uninhibited and free. I acknowledge my weaknesses without excessively putting myself down. I address the internal doubts, beliefs, and fears that block my growth. I include practices in my daily routine that keep my heart open and safe. I seek the wisdom within my heart rather than looking to others for my answers. I am confident in who I am, my strengths, and the gifts I have to share with the world. 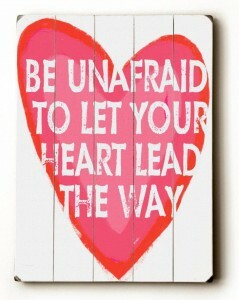 I am comfortable with uncertainty and follow the whispers and promptings of my heart. This week, practice listening to your heart and taking actions that support your desires. If you scored “3 or lower” on any statement, turn it into a positive affirmation. Write “I am learning to” in front of each statement and repeat it often. Soon you will notice more of it in your life. We are so thankful for friends, family, connections and supporters who purchased our book. We made Amazon’s Best Sellers list in the motivational self-help category, and readers are already posting 5-star book reviews! We are extremely grateful. 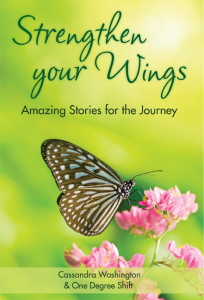 If you haven’t purchased a copy yet, get yours today and join us at Strengthen Your Wings Chat Room on Facebook to discuss it. Tell us your favorite story. Post a question. Share how the book has inspired you.